With production starting this summer, the PMC will produce just 360 units of the 2020 TLX PMC Edition, to be built by the same master technicians that hand assemble the Acura NSX supercar. 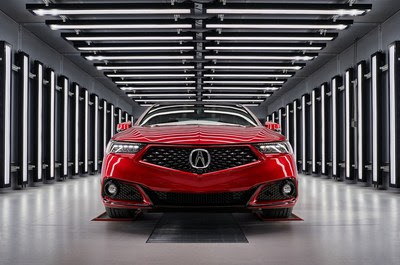 NEW YORK, April 11, 2019 /PRNewswire/ — Harnessing the unique capabilities of its bespoke Performance Manufacturing Center (PMC) in Marysville, Ohio, Acura will introduce handcrafted limited-edition vehicles, starting with the 2020 TLX PMC Edition. With production starting this summer, the 2020 TLX PMC Edition will be built by the same master technicians that hand assemble the Acura NSX supercar. Deliveries of the exclusive 2020 TLX PMC Edition will begin this summer with pricing around $50,000. An MDX PMC Edition will follow. Both the production TLX PMC Edition and MDX PMC Edition Prototype make their world debut at the 2019 New York International Auto Show and will be on display throughout public show days, April 19-28, at the Jacob Javits Center. The 2020 TLX PMC Edition will sit atop the TLX lineup, featuring Acura’s high-performance direct-injected i-VTEC® V6 powertrain and torque-vectoring Acura Super-Handling All-Wheel Drive™ (SH-AWD™) along with the full complement of premium features shared with the TLX Advance Package. In addition, the TLX PMC Edition will incorporate the bold exterior and interior design elements of Acura’s A-Spec line, plus multiple PMC Edition-exclusive design elements, inside and out. Each TLX PMC Edition is finished in Valencia Red Pearl, the highest quality, most vibrant paint ever offered by Acura and previously reserved for only the NSX supercar. This advanced paint features nano pigment technology that produces exceptionally high color saturation (chroma) and deep levels of contrast. Engineered using mica, metal flake and super-high transparency nano pigments, the paint is applied using PMC’s advanced robotic paint system in multiple base coats to enhance color intensity. This is followed by two clear coats to increase the paint’s luster. Each PMC Edition undergoes the same meticulous hand inspection process given to the NSX. The total time in paint, including curing, is five days.